Javed Akhtar, who has written some of the most interesting cop flicks for the industry is high on praise for Farhan’s portrayal of a cop in his upcoming next, Wazir. Javed Akhtar is the man behind the angry young man tag given to Amitabh Bachchan in his films. He has also written very popular cop characters in the past. 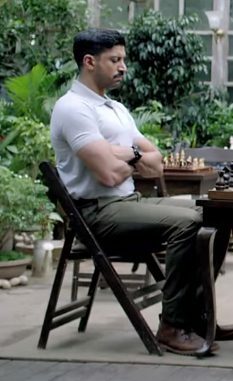 And this time around, after watching the teaser of Wazir, he has reached out to the team of the film as he is very impressed with the glimpses of Farhan playing an ATS cop. He feels that Farhan’s look is perfectly in sync with the character. Javed Akhtar is his father and also his biggest critique. So, praise coming from his end is not just for flattery as it does not come easily. Being a creative person himself, he has loved Farhan’s portrayal of the cop. This is the first time Farhan will be seen playing the role of an ATS cop and sharing screen space with Amitabh Bachchan.